Bailey, Erin 2018. Encyclopedia of Clinical Neuropsychology. p. 2196. Silverberg, Noah D. Wojtowicz, Magdalena Bui, Eric Wershba, Rebecca Zafonte, Ross Laifer, Lauren M. Simon, Naomi M. and Iverson, Grant L. 2017. Contribution of Perceived Cognitive Functioning to Quality of Life in Service Members and Veterans With Posttraumatic Stress Disorder. Journal of Traumatic Stress, Vol. 30, Issue. 3, p. 318. Bailey, Erin 2017. Encyclopedia of Clinical Neuropsychology. p. 1. Newman, Jennifer and Marmar, Charles 2017. Executive Functions in Health and Disease. p. 487. Waltzman, Dana Soman, Salil Hantke, Nathan C. Fairchild, J. Kaci Kinoshita, Lisa M. Wintermark, Max Ashford, J. Wesson Yesavage, Jerome Williams, Leanne Adamson, Maheen M. Furst, Ansgar J. and Schmahl, Christian 2017. Altered Microstructural Caudate Integrity in Posttraumatic Stress Disorder but Not Traumatic Brain Injury. PLOS ONE, Vol. 12, Issue. 1, p. e0170564. Mahabir, Megan Ashbaugh, Andrea R. Saumier, Daniel and Tremblay, Jacques 2016. Propranolol's impact on cognitive performance in post-traumatic stress disorder. Journal of Affective Disorders, Vol. 192, Issue. , p. 98. Seal, Karen H. Bertenthal, Daniel Samuelson, Kristin Maguen, Shira Kumar, Sant and Vasterling, Jennifer J. 2016. Association between mild traumatic brain injury and mental health problems and self-reported cognitive dysfunction in Iraq and Afghanistan Veterans. Journal of Rehabilitation Research and Development, Vol. 53, Issue. 2, p. 185. Mouchabac, Stéphane El-Hage, Wissam and Ferreri, Florian 2016. La mémoire intrusive dans le trouble de stress post-traumatique : apport de la neuroimagerie. Annales Médico-psychologiques, revue psychiatrique, Vol. 174, Issue. 10, p. 848. Hermelink, K. Voigt, V. Kaste, J. Neufeld, F. Wuerstlein, R. Buhner, M. Munzel, K. Rjosk-Dendorfer, D. Grandl, S. Braun, M. von Koch, F. E. Hartl, K. Hasmuller, S. Bauerfeind, I. Debus, G. Herschbach, P. and Harbeck, N. 2015. Elucidating Pretreatment Cognitive Impairment in Breast Cancer Patients: The Impact of Cancer-related Post-traumatic Stress. JNCI Journal of the National Cancer Institute, Vol. 107, Issue. 7, p. djv099. Honzel, Nikki Justus, Timothy and Swick, Diane 2014. Posttraumatic stress disorder is associated with limited executive resources in a working memory task. Cognitive, Affective, & Behavioral Neuroscience, Vol. 14, Issue. 2, p. 792. Pang, E W Sedge, P Grodecki, R Robertson, A MacDonald, M J Jetly, R Shek, P N and Taylor, M J 2014. Colour or shape: examination of neural processes underlying mental flexibility in posttraumatic stress disorder. Translational Psychiatry, Vol. 4, Issue. 8, p. e421. Norris, Jacob N. Sams, Richard Lundblad, Peter Frantz, Earl and Harris, Erica 2014. Blast-related mild traumatic brain injury in the acute phase: Acute stress reactions partially mediate the relationship between loss of consciousness and symptoms. Brain Injury, Vol. 28, Issue. 8, p. 1052. Lindemer, Emily R. Salat, David H. Leritz, Elizabeth C. McGlinchey, Regina E. and Milberg, William P. 2013. Reduced cortical thickness with increased lifetime burden of PTSD in OEF/OIF Veterans and the impact of comorbid TBI. NeuroImage: Clinical, Vol. 2, Issue. , p. 601. Swick, Diane Honzel, Nikki Larsen, Jary and Ashley, Victoria 2013. Increased response variability as a marker of executive dysfunction in veterans with post-traumatic stress disorder. Neuropsychologia, Vol. 51, Issue. 14, p. 3033. Esterman, Michael DeGutis, Joseph Mercado, Rogelio Rosenblatt, Andrew Vasterling, Jennifer J. Milberg, William and McGlinchey, Regina 2013. Stress-Related Psychological Symptoms Are Associated with Increased Attentional Capture by Visually Salient Distractors. Journal of the International Neuropsychological Society, Vol. 19, Issue. 07, p. 835. Gould, Felicia Clarke, Jennifer Heim, Christine Harvey, Philip D. Majer, Matthias and Nemeroff, Charles B. 2012. The effects of child abuse and neglect on cognitive functioning in adulthood. Journal of Psychiatric Research, Vol. 46, Issue. 4, p. 500. Dolan, Sara Martindale, Sarah Robinson, Jennifer Kimbrel, Nathan A. Meyer, Eric C. Kruse, Marc I. Morissette, Sandra B. Young, Keith A. and Gulliver, Suzy Bird 2012. Neuropsychological Sequelae of PTSD and TBI Following War Deployment among OEF/OIF Veterans. Neuropsychology Review, Vol. 22, Issue. 1, p. 21. Swick, Diane Honzel, Nikki Larsen, Jary Ashley, Victoria and Justus, Timothy 2012. Impaired Response Inhibition in Veterans with Post-Traumatic Stress Disorder and Mild Traumatic Brain Injury. Journal of the International Neuropsychological Society, Vol. 18, Issue. 05, p. 917. Bogdanova, Yelena and Verfaellie, Mieke 2012. Cognitive Sequelae of Blast-Induced Traumatic Brain Injury: Recovery and Rehabilitation. Neuropsychology Review, Vol. 22, Issue. 1, p. 4. American Psychiatric Association. (2000). Diagnostic and statistical manual of mental disorders, text revision (4th ed.). Washington, DC: American Psychiatric Publishing. Arnsten, A.F.T. (2009). Stress signalling pathways that impair prefrontal cortex structure and function. Nature Reviews Neuroscience, 10, 410–422. Bar-Haim, Y., Lamy, D., Pergamin, L., Bakermans-Kranenburg, , & van IJzendoom, M.H. (2007). Threat related attention bias in anxious and nonanxious individuals: A meta-analytic study. Psychological Bulletin, 133, 1–12. Bremner, J.D. (2001). Hypotheses and controversies related to the effects of stress on the hippocampus. An argument for stress-induced damage to the hippocampus in patients with posttraumatic stress disorder. Hippocampus, 11, 90–91. Brewin, C.R. (2007). What is it that a neurobiological model of PTSD must explain? Progress in Brain Research, 167, 217–226. Buckley, T.C., Blanchard, E.B., & Neill, W.T. (2000). Information processing and PTSD: A review of the empirical literature. Clinical Psychology Review, 28, 1041–1065. Conrad, C.D. (2008). Chronic stress-induced hippocampal vulnerability: The glucocorticoid vulnerability hypothesis. Reviews in Neuroscience, 19, 395–411. Constans, J.I. (2005). Information-processing biases in PTSD. In Vasterling, J.J. & Brewin, C.R. (Eds. ), Neuropsychology of PTSD: Biological, cognitive, and clinical perspectives (pp. 105–130). New York: Guilford Press. Conway, M.A. (2005). Memory and the self. Journal of Memory and Language, 53, 594–628. Conway, M.A., & Pleydell-Pearce, C.W. (2000). The construction of autobiographical memories in the self-memory system. Psychological Review, 107, 261–288. Ehlers, A., & Clark, D.M. (2000). A cognitive model of posttraumatic stress disorder. Behavior Research and Therapy, 38, 319–345. Geuze, E., Westenberg, H.G., Heinecke, A., de Kloet, C.S., Goebel, R., & Vermetten, E. (2008). Thinner prefrontal cortex in veterans with posttraumatic stress disorder. Neuroimage, 41(3), 675–681. Gilbertson, M.W., Paulus, L.A., Williston, S.K., Gurvits, T.V., Lasko, N.B., Pitman, R.K., et al. (2006). Neurocognitive function in monozygotic twins discordant for combat exposure: Relationship to posttraumatic stress disorder. Journal of Abnormal Psychology, 115(3), 484–495. Gilbertson, M.W., Shenton, M.E., Ciszewski, A., Kasai, K., Lasko, N.B., Orr, S.P., et al. (2002). Smaller hippocampal volume predicts pathologic vulnerability to psychological trauma. Nature Neuroscience, 5(11), 1242–1247. Heim, C., & Nemeroff, C.B. (2009). Neurobiology of posttraumatic stress disorder. CNS Spectrums, 14(Suppl. 1), 13–24. Holmes, A., & Wellman, C.L. (2009). Stress-induced prefrontal reorganization and executive dysfunction in rodents. Neuroscience Biobehavioral Reviews, 33, 773–783. Karl, A., Schaefer, M., Malta, L.S., Dorfel, D., Rohleder, N., & Werner, A. (2006). A meta-analysis of structural brain abnormalities in PTSD. Neuroscience Biobehavioral Review, 30, 1004–1031. Krystal, J.H., & Neumeister, A. (in press). Noradrenergic mechanisms in the neurobiology of posttraumatic stress disorder and resilience. Brain Research. Lew, H.L., Vanderploeg, R.D., Moore, D.F., Schwab, K., Friedman, L., Yesavage, J., et al. (2008). Overlap of mild TBI and mental health conditions in returning OIF/OEF service members and veterans. Journal of Rehabilitation Research and Development, 45, xi–xvi. Liberzon, I., & Sripada, C.S. (2008). The functional neuroanatomy of PTSD: A critical review. Progress in Brain Research, 167, 151–168. Rauch, S.L., Shin, L.M., & Phelps, E.A. (2006). Neurocircuitry models of posttraumatic stress disorder and extinction: Human neuroimaging research – past, present, and future. Biological Psychiatry, 60(4), 376–382. Roozendaal, B., McEwen, B.S., & Chattarji, S. (2009). Stress, memory, and the amygdala. Nature Reviews Neuroscience, 10, 423–433. Shin, L.M., Orr, S.P., Carson, M.A., Rauch, S.L., Macklin, M.L., Lasko, N.B., et al. (2004). Regional cerebral blood flow in the amygdala and medial prefrontal cortex during traumatic imagery in male and female Vietnam veterans with PTSD. Archives of General Psychiatry, 61(2), 168–176. Southwick, S.M., Rasmusson, A., Barron, J., & Arnsten, A. (2005). Neurobiological and neurocognitive alterations and PTSD: A focus on norepinephrine, serotonin, and the HPA axis. In Vasterling, J.J. & Brewin, C.R. (Eds. 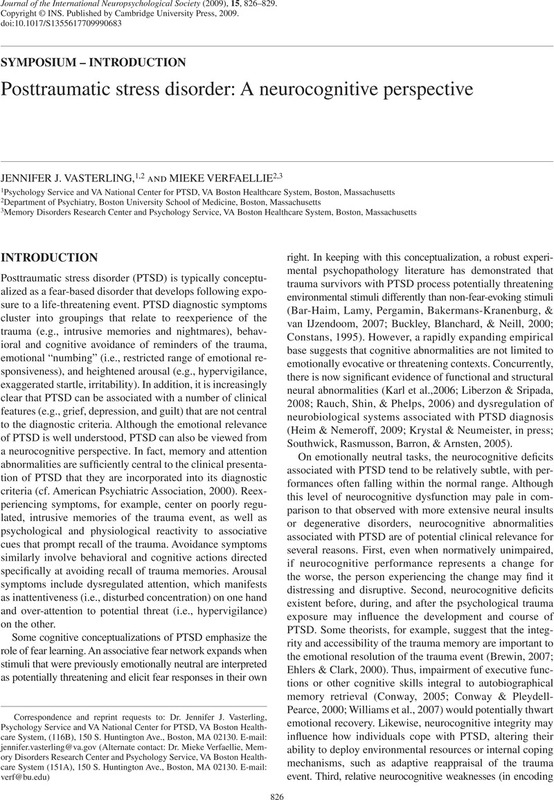 ), The neuropsychology of PTSD: Biological, cognitive, and clinical perspectives (pp. 27–58). New York: Guilford Press. Stein, M.B., & McAllister, T.W. (2009). Exploring the convergence of posttraumatic stress disorder and mild traumatic brain injury. American Journal of Psychiatry, 166, 768–776. Vasterling, J.J., Brailey, K., Constans, J.I., & Sutker, P.B. (1998). Attention and memory dysfunction in posttraumatic stress disorder. Neuropsychology, 12, 125–133. Wild, J., & Gur, R.C. (2008). Verbal memory and treatment response in post-traumatic stress disorder. British Journal of Psychiatry, 193(3), 254–255. Williams, J.M.G., Barnhofer, T., Crane, C., Watkins, E., Hermans, D., Raes, F., et al. (2007). Autobiographical memory specificity and emotional disorder. Psychological Bulletin, 133, 122–148. Woodward, S.H., Kaloupek, D.G., Streeter, C.C., Martinez, C., Schaer, M., & Eliez, S. (2006). Decreased anterior cingulate volume in combat-related PTSD. Biological Psychiatry, 59, 582–587. Yehuda, R., Tischler, L., Golier, J.A., Grossman, R., Brand, S.R., Kaufman, S., et al. (2006). Longitudinal assessment of cognitive performance in Holocaust survivors with and without PTSD. Biological Psychiatry, 60, 714–721.